Two pilgrims decided to venture off the beaten track, walking the Silver Road from Seville to Santiago de Compostela, away from the commercialism of the usual route. They tell PERRY O’DONOVAN about their journey.TIM MACEY AND Laurence Leleu were just two of the hundreds of thousands of pilgrims who walked across Spain to Santiago de Compostela last year. With nearly 250,000 people walking or cycling the required distance in 2010, the year is a record (in modern times) for Santiago pilgrim numbers. This is more than twice the usual number of pilgrims, in part accounted for by the fact that 2010 was a holy year – a year in which the saint’s day, July 25th, fell on a Sunday – and in the run-in to a papal visit. 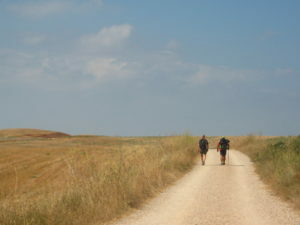 However, unlike the vast majority of these pilgrims – who came west from France and over the Pyrenees, the so-called Camino Frances – Tim and Laurence walked up from Seville in the south, the rarely travelled pilgrim route following the old Roman Silver Road, what is known as the Camino de la Plata. “The Camino Frances has become so overcrowded in recent years. You can’t do very much soul-searching if you’re on the road with two or three hundred other pilgrims every day, which is what the Camino Frances is like now – from May to October anyway,” says Tim. “One of the most important features of the Camino de la Plata is that one is travelling back in time, not just because you are on the old Roman road between Mérida and Astorga, but also because you are going back to the way the pilgrimage to Santiago was in the 1980s and 1990s: no guided tours, no travel agency packages cherry picking the way, no taxis carrying people’s rucksacks from one hostel to the next, almost no commercialisation whatever. Tim says that pilgrims going through towns and villages on the Camino de la Plata are seen as a genuine curiosity, a welcome sight, and treated as such. Whereas on the Camino Frances with hundreds of pilgrims passing by day after day, they inevitably tend to represent just so many euros per head – almost every encounter an opportunity to turn a buck. “However, it is not at all like that on the Camino de la Plata. At one point, for example, at around the halfway stage, a strap broke on one of Laurence’s sandals. At the next village we went to a shoemaker and he fixed it for us but the man wouldn’t take a cent for doing so. ‘Pray for me when you get to Santiago,’ he said. Which indeed we did. Things like that make a pilgrimage: you feel blessed by the kindness of strangers. TIM AND LAURENCE first met one another on the Camino Frances a decade ago. In 2000, Laurence started walking to Santiago from Mons in her native Belgium, and Tim, a headmaster on his first post- retirement project, was also walking west along the pilgrim pathways that criss-cross Europe, however he had started from Le Puy in south central France. All the Santiago pilgrim routes through France meet up near the Pyrenees, which is where Tim and Laurence first met and got to know one another. “The only thing with the Camino de la Plata, however,” Tim continues, “is that it is highly seasonal. There is only a small gap in the year when it is good to go. In the full summer you’re looking at midday temperatures of over 40 degrees. And several of the stages are over 30km, hostel to hostel, which is not to be recommended in such heat. “Springtime is the key season, April and May. From the end of March to the end of May the Camino de la Plata is a paradise of birds and flowers and moderate (mostly night-time) rainfall and rutting wildlife, all of which is scorched into desert-like dusty oblivion by the unconscionable heat of the sun in central Spain from June onwards. Despite the chain of ancient cities along the route – Mérida, Cáceres, Salamanca, Zamora, and Ourense – the Old Silver Road is primarily a journey of open spaces: vast fenceless plains, mountains and tableland plateaus, and forgotten little villages which seem still to be struggling with the later parts of the 20th century. Tim says that the Camino de la Plata involves a good bit of map work and planning. And there aren’t pilgrim hostels all along the way, as on the Camino Frances. Sometimes – on perhaps a handful of evenings – you have no choice but to find yourself a hotel or motel or guesthouse or whatever you can. “Also along the Camino Frances almost everyone speaks English – some bit of English anyway – but not so coming up this route,” he says. Hi Marie, great to hear that you are starting to plan the big Camino adventure. If you want more details on the different routes or if you have any specific queries you can contact our travel team at info@caminoways.com. Kind regards, Lisa. Hi there, I read your article and am excited for my just planned trip. My friend and I are planning for early April, 2017, and maybe we’ll take the route you took.